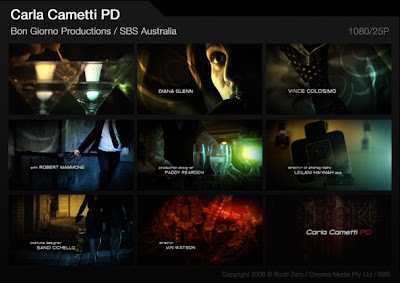 We just put the finishing touches on the opening titles and VFX for SBS's new crime drama, Carla Cametti PD. Staring Diana Glenn and Vince Colosimo, this 6-part mini-series is a stylish and romantic tale of day-to-day life colliding with the heightened reality of designer-dressed gangsters. Working with Buon Giorno Productions, we aimed to blend noir-ish imagery with a fast-paced deconstructive feel, creating an identity that conveys seduction, intrigue and a distinctly Italian flavour. The 60-second title features the beautiful Genesis footage that Leilani has captured, music by Cezary Stubiszewski and some additional photography by our own Andy Montague. We also carried out some visual effects work for the show, including creating several shots of a falling Baci wrapper and tricky mobile screen replacement. Carla Cametti PD will be hitting screens in a few months, check it out!